February 12 Migraine Chat: Join Us! Please join us today, Wednesday, February 12, 2014, for our afternoon Migraine Chat at 1 pm PT / 3 pm CT / 4 pm ET. We don’t have a set topic for this chat. We’ll just talk about anything anyone needs or wants to discuss. Share what’s on your mind and/or your questions. I’ll be traveling home from DC that day having attended the annual Headache on the Hill advocacy event, so hopefully, we’ll have a designated fill-in host. If not, please talk amongst yourselves and get to know each other better. For more information about how to participate visit, including the chat room link and password, see: Migraine Chat. 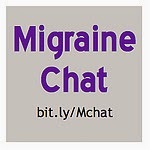 Migraine Chat is an online chat that is held twice each month on Wednesdays in a private, password protected chat room. Anyone can participate, but chatting in this setting provides a more comfortable atmosphere for those who don’t want to share all their thoughts about living with a Headache Disorder through Twitter or other social media. Please “like” the Migraine Chat page on Facebook so you can stay abreast of all the latest announcements and help spread the word on Facebook: Migraine Chat page on Facebook. I’m always looking for Migraine Chat participants who are willing to serve as guest moderators. I’m also interested in hearing your ideas for themes. Please email me at [email protected] if you’re interested! There is no need to RSVP or register to participate in any of our Migraine Chats. Just show up & join in. It’s truly as simple as that. Hope you can make it!